Snakes might not be considered the most attractive sorts of animals - but even the beauty of a less-appreciated being is undeniable when viewed through the eyes someone who knows they too are worth saving. Chanda Lowe was out for a hike near her home in Southern California when she ran across a creature who'd fallen victim to a passive act of human cruelty. 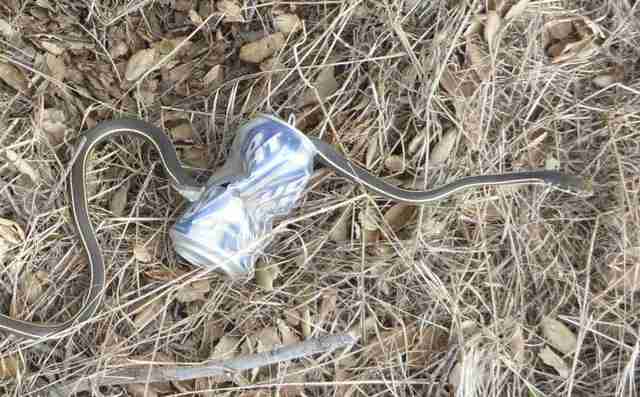 There, trapped by an improperly disposed of beer can, was a whip snake struggling to stay alive. Though she could have walked away, leaving the "scary" animal to die - Lowe refused. 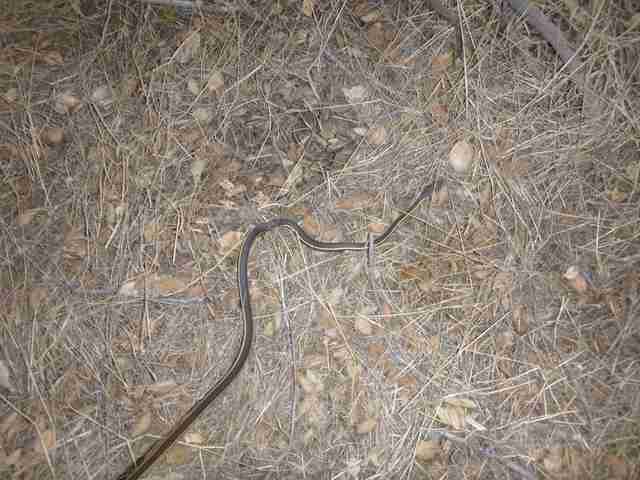 "I helped the snake because I like pretty much all living creatures (including snakes) and hate to see one suffering," Lowe told The Dodo. "If there's something I can do, I really can't just walk by and do nothing, whether it's a cute, fluffy kitten or something a little less socially appreciated, such as a snake or a tarantula." With her permission, we've shared Lowe's account of that lifesaving rescue. 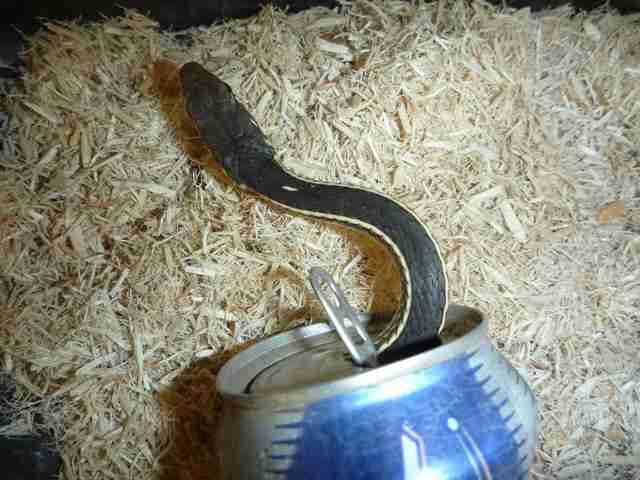 "The hole in the side of the can was too small for the snake to get its entire body through, leaving it stuck in the can." 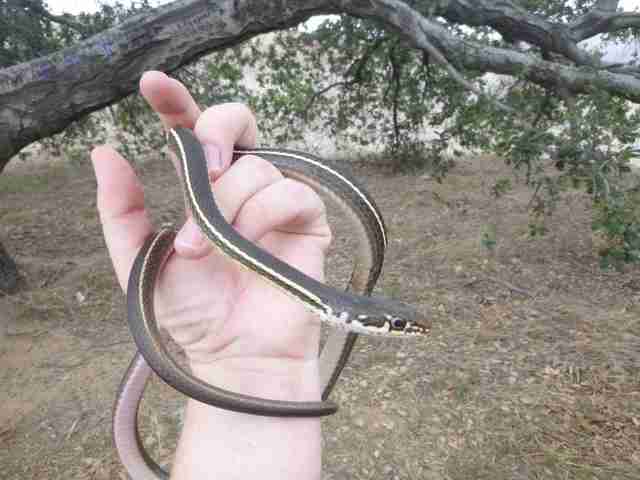 "As the snake thrashed around in an attempt to free itself, it was cutting itself on the sharp edges of the aluminum. 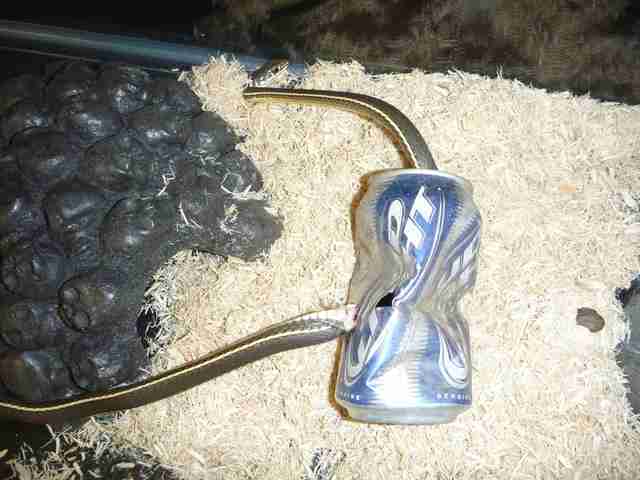 I brought the snake back with me so I could cut the can off of it. 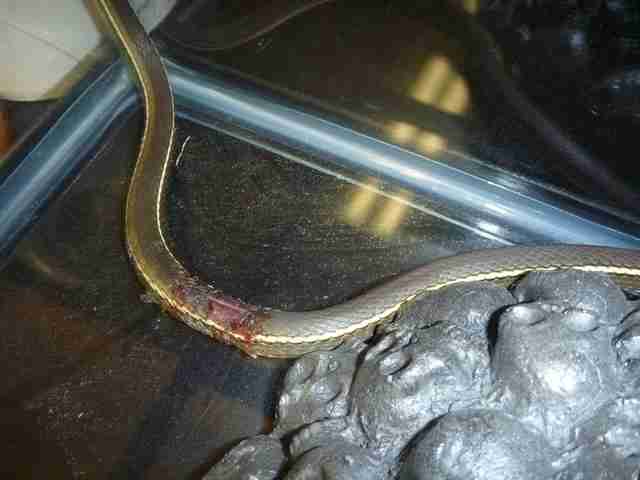 "The snake was injured from its ordeal, so I kept it for a while and treated the wounds with antibiotic ointment." "I let my son's science teacher keep it in her classroom during its recovery, so she could share it with her students. Every morning I dropped in before school to check on it and reapply the antibiotics. 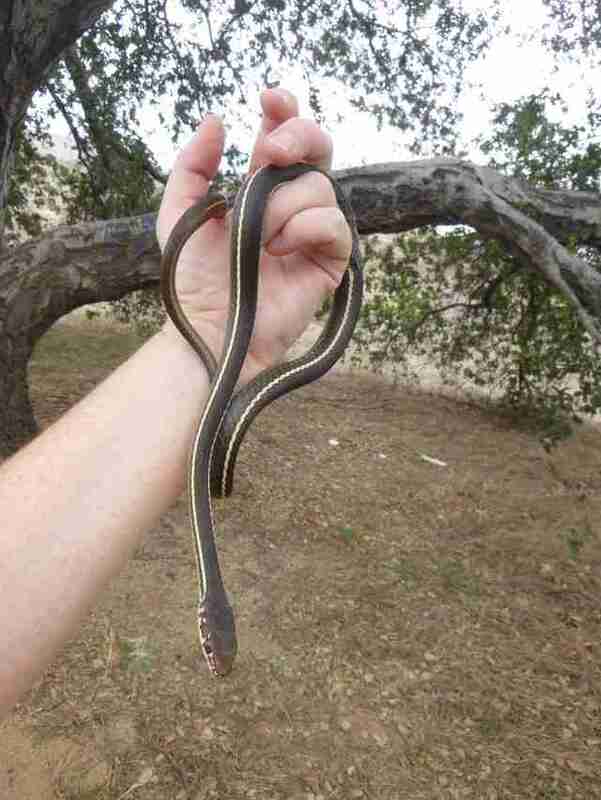 "Although that must have hurt, the snake was very cooperative and never tried to bite." 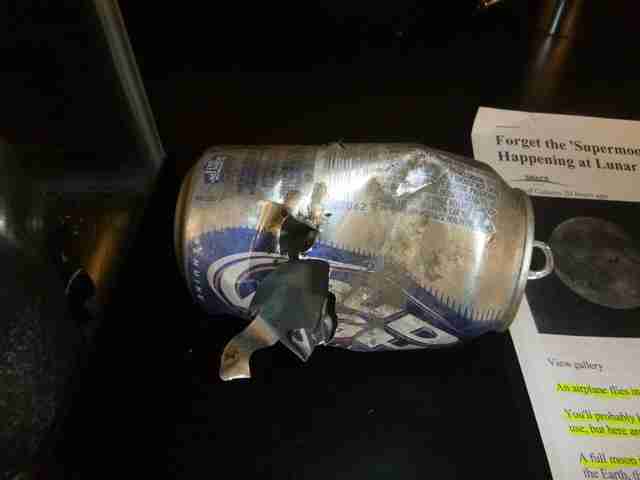 "This is the offending beer can, after it was removed. We used the can (and snake) as an object lesson for the students about the importance of picking up their trash." 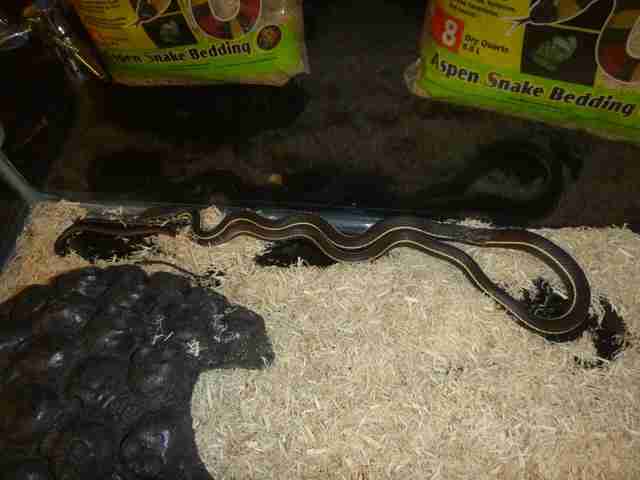 "During its recovery, the snake served as a classroom ambassador to help students learn more about snakes and (for some) to help them overcome their fear of snakes." "The little guy was quite docile and amenable to handling, making him the perfect ambassador. "However, from what we read online, this species does not do well in captivity, so after about a week and a half, we decided to release him." 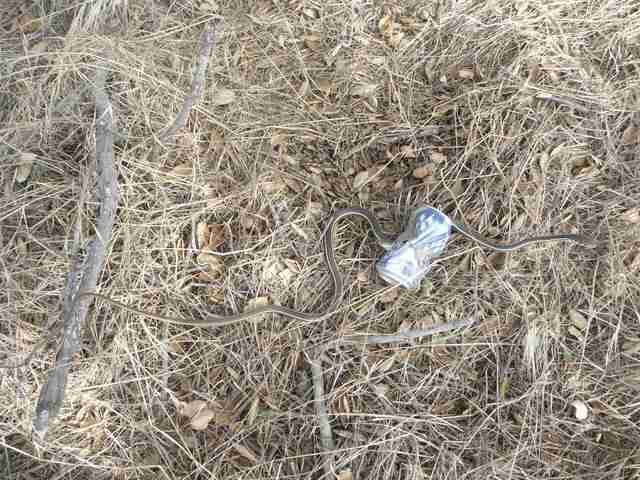 "I took him back out to the same place where I'd found him..."
Thanks to Lowe's efforts to counteract the near-fatal consequences of some jerk's decision to litter, the snake has been given a second chance. "I thought it was important for the students to see such a dramatic example of the damage that littering can do - and realize that even one person can make a difference." Indeed, that's a lesson many adults can learn from too.